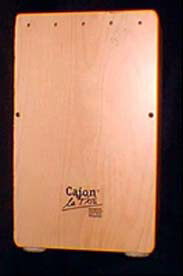 The cajon is a wooden box that is played like a conga drum. Two versions exist, the large one from Peru (pictured here, made by the German company Schlagwerk Percussion) and a smaller version held between the legs from Cuba. The Peruvian version is similar to the Ghanaian gombe in that the player sits on the top and can change the pitch with the heels of the feet while playing. The player uses a technique with the hands similar to Cuban conga drumming in that an open tone, bass tone, and slap are produced. Frame drum technique and brushes also work very well on this drum making it suitable for many kinds of musical application. This one by Schlagwerk features metal snares and pellet bells mounted on the inside of the playing surface.